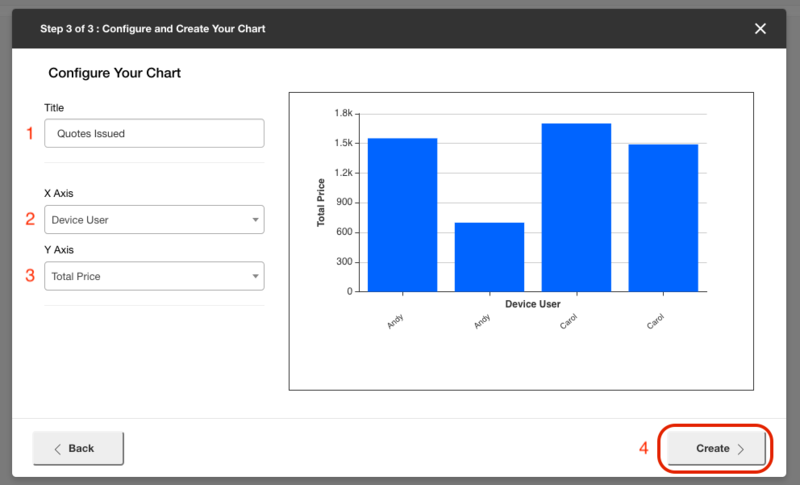 Analytics is a tool which allows users to create charts to visualize data collected within Device Magic. 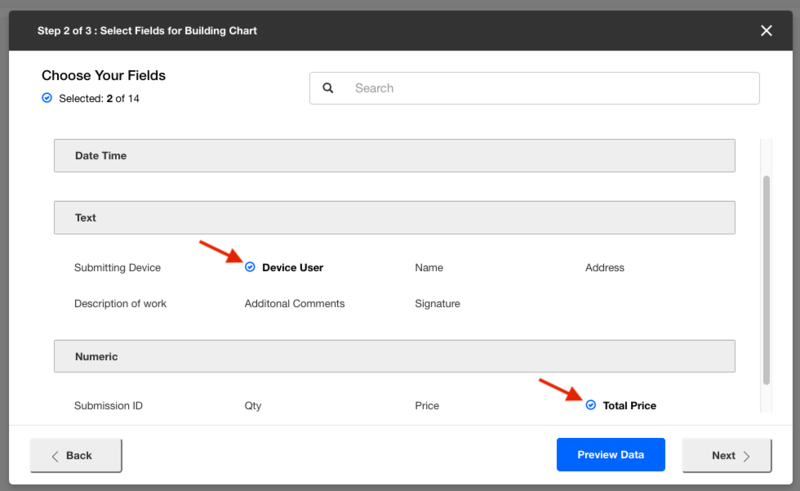 This article provides a walk through of creating your first chart and covers the features included in Analytics. Analytics is available for qualifying Enterprise accounts. First, navigate to your Device Magic Dashboard and click "Analytics". When the Analytics page is visited for the first time, a blank Dashboard will be displayed. A Dashboard is where the charts you create will be displayed. To name your Dashboard, simply hover over and click the name of the Dashboard to edit the title. An optional description can be provided below the title using the same method. To access these options, click the down arrow icon next to the name of the Dashboard. You have the option to create multiple customized Dashboards. All of your previously created Dashboards will be listed at the top of the menu. Clicking the title of the Dashboard will redirect you to that Dashboard page. 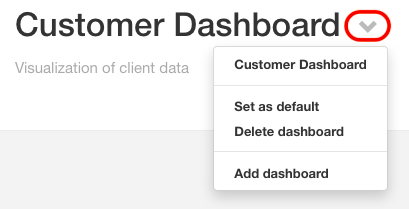 Set as default - Sets the current Dashboard as the Dashboard you visit after clicking Analytics on the sidebar. Delete Dashboard - Removes the current Dashboard. This action cannot be undone. Add Dashboard - Redirects you to a newly created Dashboard. 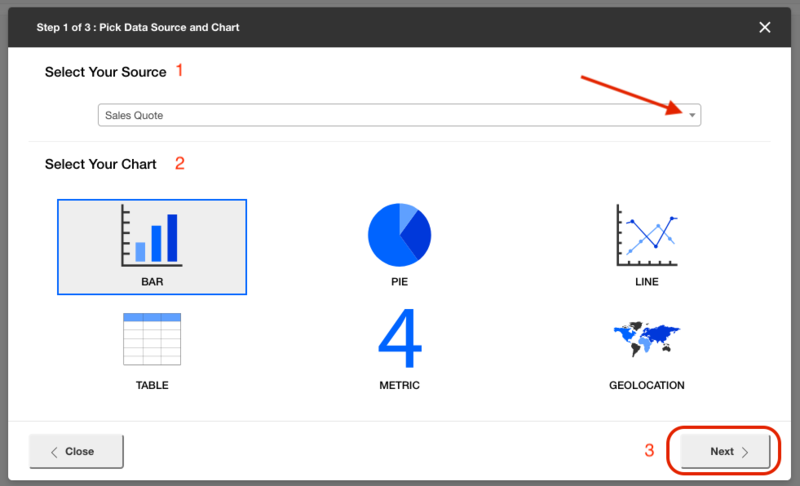 To add a chart to a Dashboard, click the "+ Add Chart" button on the right side of the page. 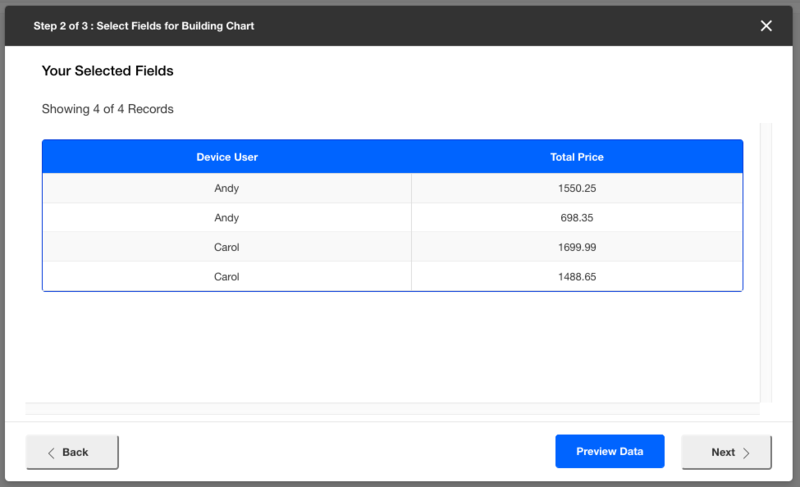 After, a menu will appear where you can choose the source of your data and select the type of chart required. The "Select Your Source" drop down will only contain names of forms which have at least one submission in the Device Magic Database Destination. The data for the chart is mapped directly from this source. 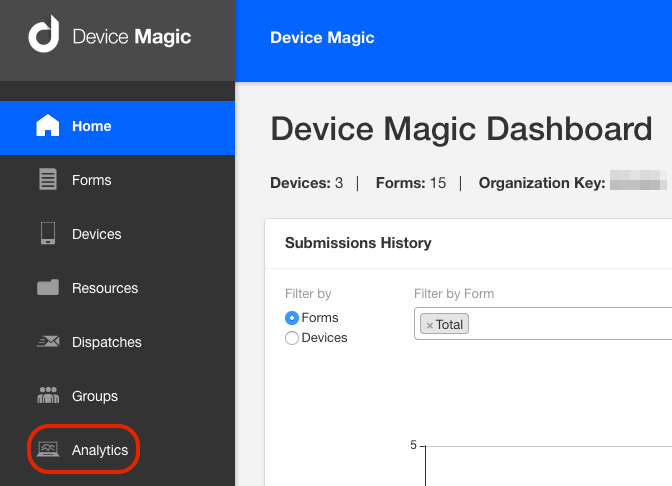 The Device Magic Database Destination should be added to your form by default, for instructions on enabling this Destination, please visit this article. Click the "Next" button after completing these steps. 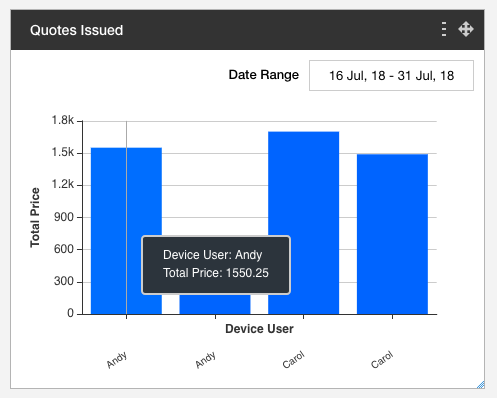 Two fields have been chosen for this bar chart example, Device User and Total Price. The Device User is a metadata field which is the name of the device and the Total Price is a question in the mobile form. The option to preview the data is available towards the bottom of the menu. Click "Next" when you're ready for step 3. A title for the chart can be added in the "Title" section. Then, choose the X and Y Axis values for the chart. These drop downs will contain all previously selected questions in step 2. A preview of your chart will appear on the right side of the menu. When you're satisfied, click "Create". On the top right-hand corner of your chart, you will be able to select the "Date Range", chart options menu, and move your chart. For more information on these features, please view this article.